With their small screens and our bulky fingers, smartwatches aren’t the easiest devices to control. Researchers have invented new ways to interact with them that ease the fumbling, however. The research was presented at several conferences in the fall, most recently in Niagara Falls at the 2016 ACM International Conference on Interactive Surfaces and Spaces in November. Cheng Zhang, a PhD student at Georgia Institute of Technology, oversaw WatchOut, an interaction technique that uses taps and scrolling gestures on the case and watchband, “outside” the watch screen. They’re possible because of the watch’s gyroscope and accelerometer sensors. One demo app allows wearers to scroll up, down, left, and right by swiping on the watchband. According to Zhang it makes it easier to interact with GPS maps or menus. His study shows that scrolling on rubber watchbands was more accurate than leather bands due to the different friction of the materials. Hands-free control is exactly what another Georgia Tech team, led by PhD student Gabriel Reyes, had in mind. One day he watched his wife blow a piece of fuzz off her phone while holding their newborn son. He and a team of students later created Whoosh, a technique that allows a person to control the watch by blowing, exhaling, shushing, sipping, or puffing on the screen. The watch uses its microphone and machine learning to identify the breath patterns of each acoustic event, then assigns an action to each. For example, a wearer can shush the watch to ignore a call or blow on it twice to accept. In another scenario, a combination of lock or short breaths can lock or unlock the watch. Voice recognition sometimes produces incorrect words when dictating a text message. Blowing quickly on the watch can erase words, while blowing on it longer will send the text message when ready. Finally, the technique also works with smartphones. A user can transfer content from the watch to a smartphone simply by sipping it off the watch and puffing it on the phone. 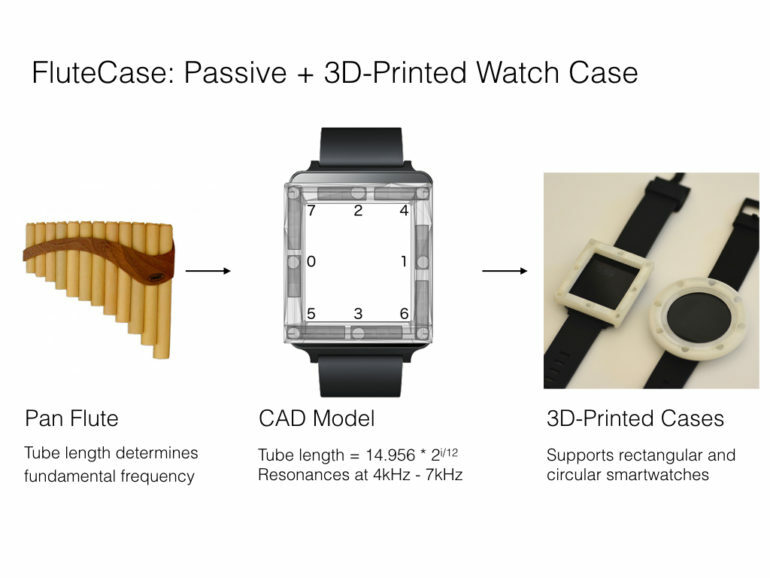 Dingtian Zhang, a PhD student and labmate of Reyes, also designed a 3D-printed case that snaps onto the watch. The attachment has eight holes around the bezel, each with varying lengths. When a wearer blows into each of the holes, unique frequencies are generated much like a flute. The watch’s microphone and the Whoosh system detects the subtle differences in the frequencies produced and identifies the intended target. Each target is linked to a specific action within applications.